We arrived at 1 pm and the place was heaving. There was no clear system for queuing for tables vs queuing for the deli and unfortunately this led to some confusion with people who came in after us getting seated first. The owner was extremely apologetic about this when the mistake was pointed out, and did offer us free prosecco (damn it was a work day) and we were seated at a makeshift table, which was a little cramped but fine. The menu was attractively written in part-english, part-italian, which brought an air of authenticity but did mean I wasn’t entirely sure of exactly what was on offer in some cases. I am sure, though, that if needed the attentive staff would have explained it to us. 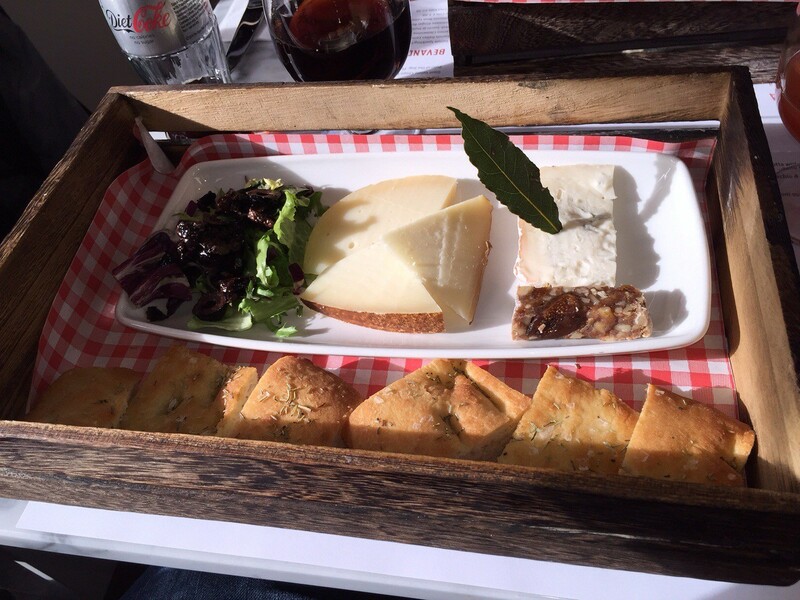 We plumped for the Parma Selection Platter and the Classic Artisan Cheese Selection Platter, and shared them. These were described as either a starter for two or a main for one, which I would agree with. The Parma Selection included three different types of parma ham, served with a melon jam, which was fresh, unusual and delicious. The Cheese Selection had three different cheeses and was served with the most amazing tuscan, fig and nut torte which was crunchy and soooo yummy. Both were served with focaccia and side salad. 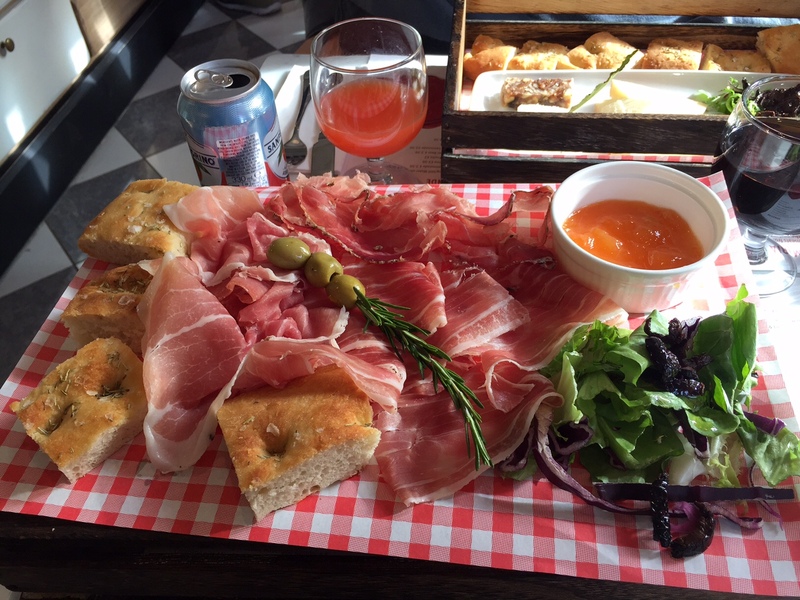 We really enjoyed sharing these as a lunch but I would say that if you were not sharing two different platters between you it would be quite samey- you would either be eating just a plate of cheese or a plate of parmaham. What I felt was missing off the menu was a mixed platter where you could get a wee taste of everything. We were sitting near the deli counter and the food displayed there was mouthwatering. 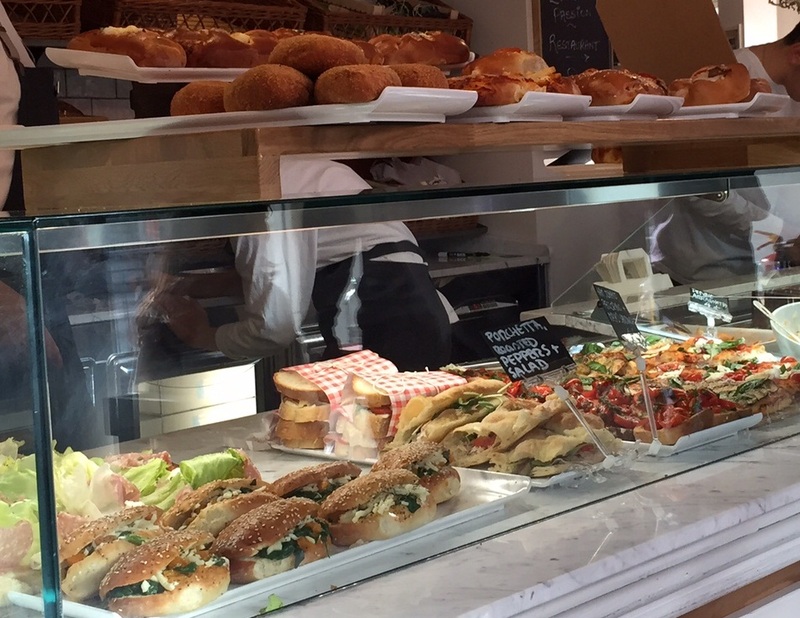 Offers for take-away lunch included rolls with porchetta and roasted peppers, and focaccia topped with fresh mozerella and tomatoes. They also do take-home meals for you to heat up for your dinner, such as stuffed peppers or yesterdays lasanga (we all know it tastes best the next day). The pasta is made fresh on the premises everyday and by peeking at other tables the pasta dishes being served looked simple, traditional and delicious. 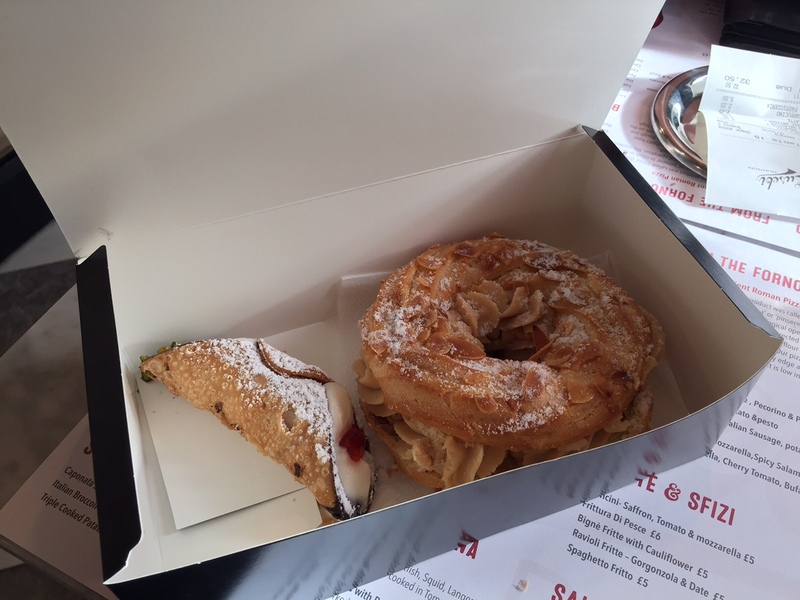 As we were on a work lunch break we got coffee and cake to take-away. My latte would have been better if a little stronger, and unfortunately Colin’s cappuccino was a little burnt. Colin took our cakes home and we had them as an after dinner treat and what can I say they were amazing!!!!! The cannoli was crunchy on the outside with a dusting of pistachio. Unfortunately, we didn’t get the name of the other cake but it basically looked like a bagel but tasted like a blend of croissant and donut, filled with coffee icing, topped with almond flakes-we really did fight over that one. Service- 4/5: Despite the initial mix-up with seating the service was attentive and friendly. Even though the take-away and seating area were full, due to the number and efficiency of staff food was served quickly. The owner was lovely, very active in instructing staff and checking on customers, which I was impressed with. Food- 4/5: The food was simple and fresh but I think a mixed platter would really add to the choices on offer, as it would have been quite a boring lunch to get a platter to yourself as a main. The coffee was disappointing but they were very busy so I think has the potential to be better. The deli food looked so appetising and I think that this place is tempting on so many levels: to sit in for a meal, meet a friend for coffee and cake or grab a sandwich for lunch. It would also be a great place to pick up a delicious dinner to take home, on one of those nights where you want the taste of a homemade meal but can’t be bothered making it. Atmosphere- 3.5/5: Eusebi’s is scoring lower on atmosphere, almost due to its success. The seating area hugs the deli-counter and this means that sitting during the lunch rush felt quite cramped and crowded. However, I suppose this is the feel of a deli rather than a restaurant. I think if you are looking for a more relaxing meal, go outwith the lunch hour when the deli counter may be quieter. Price ££- Two platters, soft-drinks, take-away cakes and coffee came to £32.50. Not the cheapest work lunch on offer but the quality was good. Overall Score- 11.5/15: I am definitely going to develop a big belly if I return to the delights of this deli. I will take the risk though got both take-away and sit-in, but maybe avoid the lunch rush for the latter.